When it comes to house construction.. getting the footings right is very important. Small variations in footings normally can be corrected when foundation walls are put up,but large ones create a much bigger problem. If you plan on having a foundation contractor put up your foundation, then they will probably want to do the footings as well. 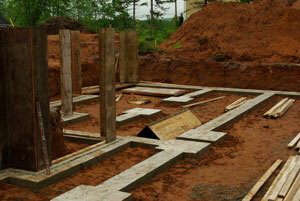 The size of your footings will depend on the type of soil and thickness of foundation walls. The building inspector will normally specify footing requirements. Footings need to be placed on undisturbed soil,if excavation is too deep.. then concrete should be used to fill in. Where pipes pass under the footings, reinforcement with rebar must be used in that area. The footing forms can be made from one or two inch boards..the width of these boards depends on the thickness of the footings. 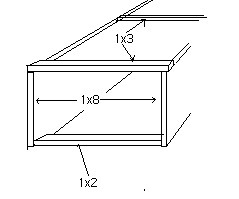 If one inch boards are used,more bracing will be required to keep the sides from bulging when the concrete is poured. The foundation must be tied to the footings...this can be accomplished with a key way in the footing or short lengths of rebar placed every 2 or 3 feet in the footing when the concrete is wet. The picture above shows a footing poured with a key way in the center. Since I was going to be using 8” concrete blocks for my foundation walls, I decided to built and set my footings and have them ready for the mason to lay the blocks. My first step was to recheck the batter boards to make sure they had not moved during excavation and then reset my grade and elevation lines from the marks I had placed on the boards. With a plum bob I marked the outside corners .From these marks I placed, aligned,squared and leveled my prebuilt forms. Oh yes...I built my forms first..I found this a much easier way to go. My footing forms were built from 1x8 boards with 1x3 boards nailed across the top every 3 to 4 ft. and a 1x2 spacers tacked at the bottom. Once the footing forms were erected and poured and allowed to set, I established my corners from the batter board lines. By driving a nail in the concrete to mark the corners,I was able to connect each corner with a taut string, that marked the outside of the foundation wall. At this point I was ready for the mason to lay the blocks.